1. Remain in quiet bus line in school. 2. Walk in a single file on sidewalk to and from bus. 3. Enter bus without crowding, shoving or pushing. 4. Sit where directed by the bus driver or chaperone. 6. Obey all directions of the driver promptly and courteously. 7. Keep all portions of the body inside the bus. 8. Keep hands and feet to self - NO FIGHTING. 9. No yelling, swearing, or loud talking. 10. No throwing of any items from the bus or inside the bus. It is school policy that bus students must have written permission from a parent or guardian for each instance they do not take the bus, or if they are going to someone else’s house. All Kindergarten students who ride a bus must have a parent present at the bus stop. For all other grade levels, we STRONGLY ENCOURAGE PARENTS TO MEET THEIR CHILD AT THE BUS STOP! Possible denial of bus privilege for up to one week. Possible denial of transportation for increasing lengths of time. Bus transportation is provided as a privilege to those who live outside the board-approved mileage limits in which a student can walk to their assigned school. Bus transportation may also be provided for a school-sponsored field trip. It is the responsibility of the school and the bus company to provide a safe environment for those students to get to and from school. Thus, a disciplined atmosphere must be maintained. 1. Students who are provided district transportation are to remain on school property upon arrival to the middle school. 2. The bus drivers are your supervisors and are in charge. Their instructions are to be obeyed and their rules followed. 3. 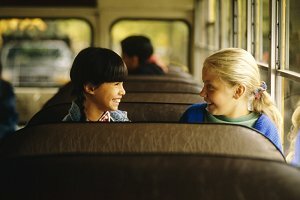 The same standard of conduct that applies in the classroom is expected on the bus. 4. Profanity will not be tolerated. 5. Use quiet voices. Enter and exit the bus quietly. 6. No food or beverages. 7. Remain in your seat. The driver is authorized to assign a seat if necessary. 8. Identification must be shown if requested. You are required to ride your assigned bus. 9. Riding the bus is a privilege, not a right. Failure to abide by the rules will result in the loss of your bus riding privilege. 3. Sit where directed by the driver or chaperone. 4. Keep all portions of the body inside the bus. 5. Obey all directions of the driver promptly and courteously. 6. Engage in appropriate behavior. No yelling out windows. No throwing of items from bus windows. 7. Present proper bus pass upon request from the driver or other school official. Students are liable for any damage done to the inside of the bus. Violations of any of the above items will result in the student being denied the privilege of bus transportation and/or placement on the appropriate disciplinary step. The length of time for the “suspension of the bus privilege” shall be determined by the administrator handling the situation relative to the violation. If a student is sufficiently disorderly so that the safe operation of the bus is endangered, the vehicle will be stopped; the driver will call the Director of Transportation by radio or telephone for assistance, and will remain with the bus passengers until the police arrive. The disorderly student(s) will be subject to immediate arrest. There is a High School late bus at 3:30 p.m. and a Middle School late bus at 3:20 p.m. There are no elementary late buses. ONLY students who have participated in an extracurricular activity or after-school detention may ride the late bus. Students will be given a pass for this bus. Students without a pass will need to call his/her parents for transportation home. All BOCES students will be issued bus passes and assigned seats by the Director of Transportation. If a student is found not sitting in his/her assigned seat or violating any of the previously listed rules of bus conduct, the Director of Transportation may revoke the privilege of bus transportation. All afternoon BOCES students are to report to their designated BOCES bus at the end of period 5 (11:35 a.m.). All students will walk in an orderly manner to their assigned buses and seats when released by proper authority. The buses will leave at 11:50 a.m. for the BOCES Center.